Peaches are the only fruit trees commonly pruned in early spring during or immediately following bloom rather than while dormant! Happy Spring, Fellow Orchardists! 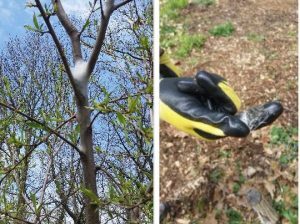 With the past few weeks of balmy rain and bud and flower break, we wanted to remind you of some early spring tips for tending to your orchard’s health and managing potential disease and pest woes. For a recap of orchard care through all the seasons, check out our recent POP blog article. With the danger of hard frosts finally past, it is now safe to unwrap your figs, pomegranates, and other tender plants from their winter protection! Apply holistic orchard sprays. Holistic sprays are composed of compost tea, liquid fish/seaweed, neem oil, and/or effective microbes. 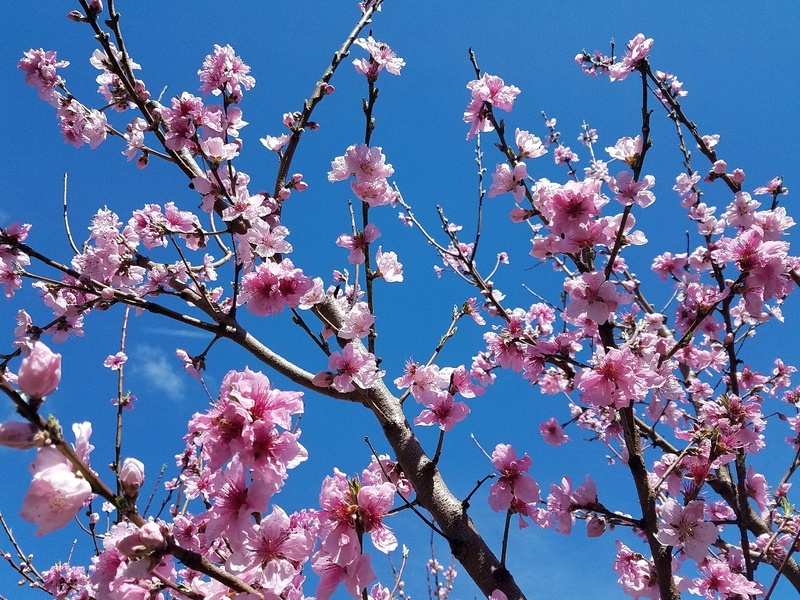 For best tree health and resistance to disease, apply up to 4 times in the spring (after bud break, at first pink of flowers, after petal fall, and two weeks after petal fall). Depending on specific pest or disease problems, some orchardists might also consider other organic sprays including the ones listed below. In particular, plants that have suffered severe crop loss from fungal diseases (like brown rot, mildew, or scab) may be candidates for an early spring sulfur or copper spray. 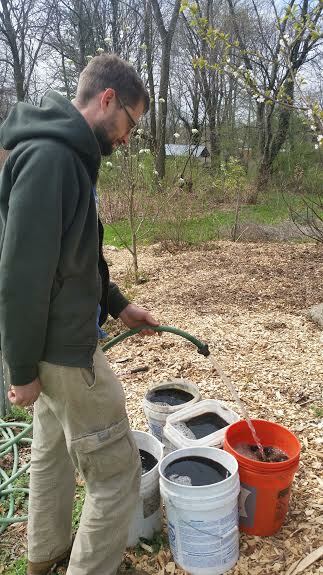 Phil dilutes compost tea 50-50 before applying one gallon per tree throughout the Awbury orchard. Building healthy soil is key to supporting trees’ health, resilience and yields. Weed around the base of trees, and spread chipped winter prunings, shredded leaves, and or mulch/compost in the early spring. Check out POP’s guide to Ramial Wood Chips and Weeding in Place. Keep an eye out for any diseased, damaged, or disoriented wood that should be pruned away no matter the season. 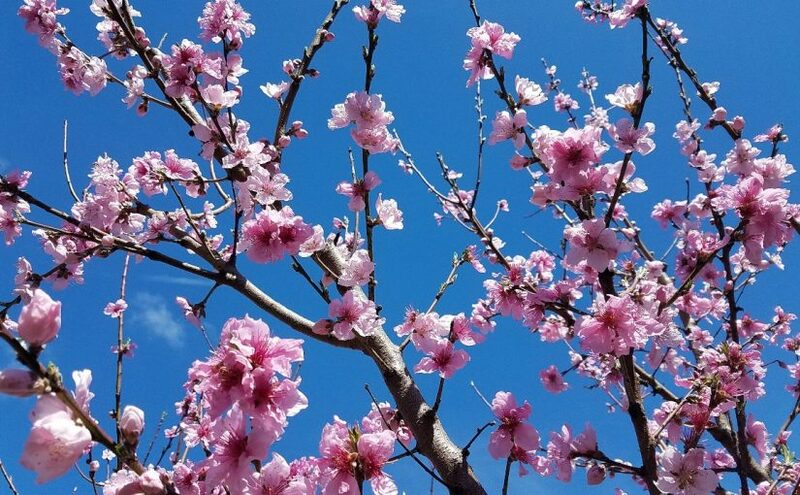 Pay special attention to the base of trees – especially of the stone fruit varieties: apricots, peaches, plums, nectarines – and prune away root suckers, the quick upright growth that can be a cover for dreaded borers, which make a home beneath trunk wood. Remember: use sharp, rust-free hand tools and sanitize between trees at the very least, and between every cut if the tree you’re tending has had previous conditions. For easy disinfecting, we recommend carrying a spray bottle with you of isopropyl alcohol or a bleach solution (1 part bleach: 10 parts water) to wipe down tools. Remove any mummified fruit, which left hanging on the tree, can become a potential source for disease spores to spread, especially as the humidity rises. Tent caterpillars are moving in! Remove nests manually to protect trees from defoliation. Spring is the season tent caterpillars hatch! Stopping them in their silky tracks is important to protect trees from becoming a buffet. If you see a silken nest hanging among tree branches, remove and discard as soon as possible. Scrape off and discard overwintering egg masses and tear the protective tents out by hand before the larvae start to feed. A spiky stick can be used to remove the tents or they can be pruned out depending on their location. Bacillus thuringiensis or a plant-derived insecticide like neem oil can be used as a spot treatment. Read more about treatment strategies here.